Mexican rice, beans, cheese, lettuce, cilantro and tomatoes stuffed into warm taco shells and topped with a creamy green vegan sauce. 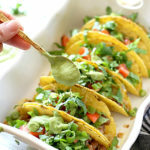 Super easy and healthy recipe for hard shell tacos in under 30 minutes! In a skillet add the rice and broth and bring to a boil. Cover and turn the heat to low to simmer for 20 minutes. Meanwhile chop vegetable toppings, rinse and drain the beans and make the vegan green sauce. To make the sauce either soak the cashews in 1 1/4 cup of water for 3 hours or an extra smooth sauce. Or soak for 10 minutes then blend drain the water and blend with the cilantro leaves, basil, mint, olive oil, garlic clove, black pepper, salt, apple cider vinegar, lemon or lime juice and the zest of lemon or lime until smooth. Preheat the oven to 350 degrees. Prepare a 9 x 13 baking pan or smaller by lining upright hard taco shells. When the rice is done cooking add the salsa and cumin and stir on low for about 1 minute. Layer each taco shell with the Mexican rice, followed by beans then cheese. Repeat for each taco. Place in the oven and heat for about 5 minutes until the cheese is melted. Remove from the oven and top with lettuce, tomatoes, cilantro, green onions and the vegan cashew green sauce or avocado taco sauce. *To save time make the rice ahead of time and store in an airtight container in the refrigerator. Simple heat on the stove top before adding to the tacos. *Serve extra rice on the side.